In a recent microcode revision guidance (PDF), Intel admits that it would not be possible to address the Spectre design flaw in its specific old CPUs, because it requires changes to the processor architecture to mitigate the issue fully. The chip-maker has marked "Stopped" to the production status for a total 9 product families—Bloomfield, Clarksfield, Gulftown, Harpertown Xeon, Jasper Forest, Penryn, SoFIA 3GR, Wolfdale, and Yorkfield. These vulnerable chip families—which are mostly old that went on sale between 2007 and 2011—will no longer receive microcode updates, leaving more than 230 Intel processor models vulnerable to hackers that powers millions of computers and mobile devices. According to the revised guidance, "after a comprehensive investigation of the microarchitectures and microcode capabilities for these products, Intel has determined to not release microcode updates for these products for one or more reasons." Spectre variant 2 vulnerability (CVE-2017-5715) affects systems wherein microprocessors utilize speculative execution and indirect branch prediction, allowing a malicious program to read sensitive information, such as passwords, encryption keys, or sensitive information, including that of the kernel, using a side-channel analysis attack. 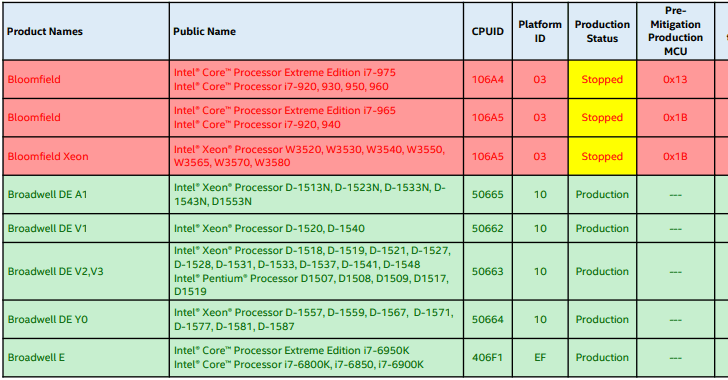 However, these processors can install pre-mitigation production microcode updates to mitigate Variant 1 (Spectre) and Variant 3 (Meltdown) flaws. "We've now completed release of microcode updates for Intel microprocessor products launched in the last 9+ years that required protection against the side-channel vulnerabilities discovered by Google. However, as indicated in our latest microcode revision guidance, we will not be providing updated microcode for a select number of older platforms for several reasons, including limited ecosystem support and customer feedback." says an Intel spokesperson via email. Besides Intel, AMD Ryzen and EPYC processors were also found vulnerable to 13 critical vulnerabilities that could allow an unauthorized attacker to access sensitive data, install persistent malware inside the chip, and gain full access to the compromised systems. AMD has acknowledged reported vulnerabilities and promised to roll out firmware patches for millions of affected devices in the coming weeks. However, CTS Labs, the security firm that discovered and disclosed the vulnerabilities, claimed that AMD could take several months to release patches for most of the security issues, where some of them cannot be fixed.